Want an unforgettable Alaskan experience? Curious what it was like to travel the state 50, 75, even 100 years ago? Then you need to book a night in an authentic, historic roadhouse. I found one in Gakona, Alaska. And not only did I spend the night there, and eat dinner there, the owner darned near saved me from a catastrophe on the road. The Gakona Roadhouse (Officially, the Gakona Lodge and Trading Post) is located two miles east of the intersection of Alaska 1 and Alaska 4, otherwise known as the Richardson Highway and the Tok Cutoff (not to be confused with the intersection of Richardson Highway and Glenn Highway, a few miles down the road). The Gakona Roadhouse is near the confluence of the Gakona and Copper Rivers. I absolutely, positively miscalculated my gas usage and mileage on my way south to Gakona, for the final overnight stay on my Alaskan vacation. I took a detour on the Denali Highway, about an hour north of Gakona, and while that detour was excellent, it also used up more gas than I had expected. When I got back to Paxson, my car told me it only had about 60 miles worth of gas in the tank. And it was about 60 miles to the roadhouse. I checked with a couple of businesses along the way, but they were either closed, or the pumps were dry. Soon, I accepted that there wasn’t anything I could do, other than drive slowly and steadily towards my destination, and hope for the best. When I rolled into the Gakona Roadhouse, my car told me I had five miles of gas remaining. That probably wasn’t even enough to make it to the nearest reliable station in Glennallen. I was at the mercy of my innkeeper. As I checked in, I asked him if he had a gallon of gas to spare. After explaining the situation, he allowed me to purchase five gallons from his supply. Even though he doesn’t usually sell gas, he had a big tank on-hand. After all, this is a roadhouse. They have what you need. He also asked me if I had eaten. I hadn’t even thought about my fuel tank, I was so focused on my car’s. Next door to the roadhouse, the Trapper’s Den is a bar and restaurant. He called over and asked them to keep the grill on, and throw a hamburger on for me. … in a rough-and-tumble-looking place like this. Sure, I didn’t quite fit in, given my choice of drink (ice water in a jar). But a trip to Alaska will expose you to situations that you probably wouldn’t experience at home. And everyone in the bar was quite friendly. Way back in Fairbanks, 12 hours earlier, I was searching for a decent, and affordable, place to stay, somewhere in the area of Gakona or Glennallen. I needed a halfway stop between Fairbanks and Anchorage, to break-up the long drive. I found the Gakona Roadhouse, and I liked the idea of only paying $79 for a room. That might be pricey elsewhere, but in Alaska it’s a bargain. This is what $79 gets you, at a roadhouse in the middle of nowhere in Alaska. That’s a twin-size bed in a narrow room that’s barely wider than the mattress. I had two windows, two lights, and one outlet. The hallway, and just about every other floor in the second story, slanted in one direction or the other. This place was real. 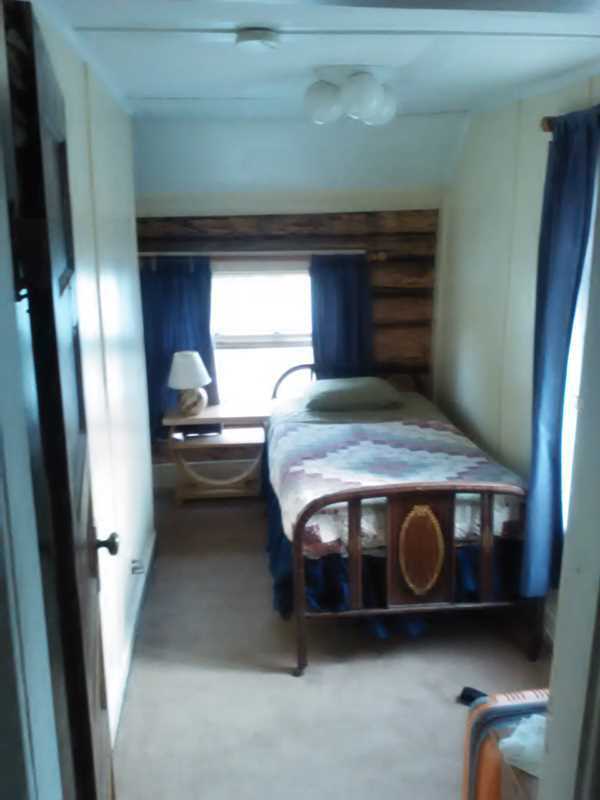 The bathroom was down the hall, and was shared by all of the bedrooms on the roadhouse’s second floor. Sharing a bathroom wasn’t a problem, because I was pretty sure I was the only person staying overnight. I saw several other rooms that were vacant, and much more spacious. If I had one complaint, It would be that they could have upgraded me to a larger room. By the time of my checkin, well after 9 p.m., it was pretty obvious no one else was staying there that night. But these are the people who saved me from waiting three hours for a AAA truck to drive up from Anchorage with a gallon of gas, so I wasn’t going to complain. I had everything I needed. … and stopped at a roadside viewpoint. Here, the braided Copper River is directly below, and the mountains of Wrangell-St. Elias National Park stood in the distance, partially shrouded by a cloud cap that was catching the final light of the day. It’s a beautiful view, looking up and down the Copper River. 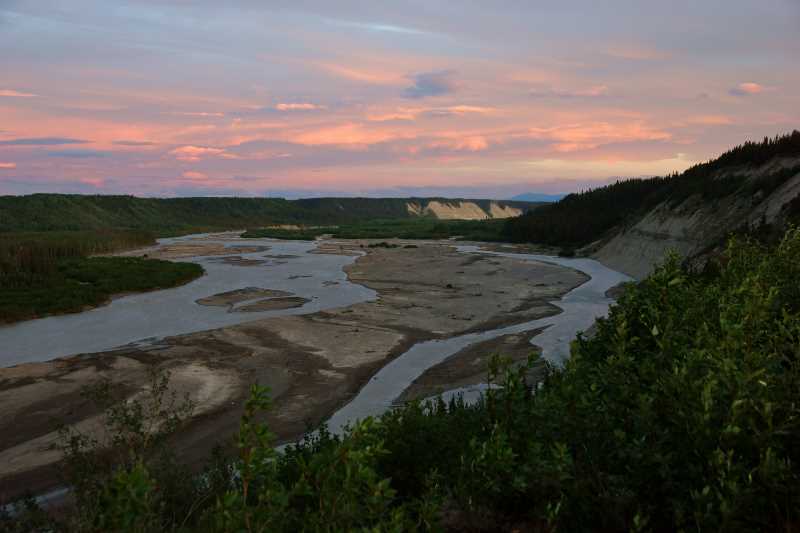 This mighty, glacier-fed river starts in the Wrangell Mountains, and heads south to the Gulf of Alaska. 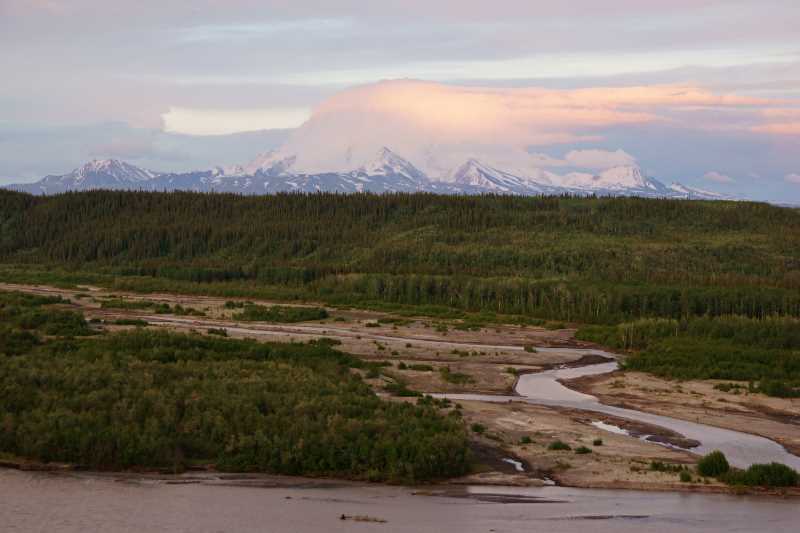 Based on the volume of water it carries, the Copper River is the 10th largest river in the U.S. I headed back down the hill to my tiny room, and settled in. The bed was adequate, but not the most comfortable thing I’ve ever slept on. Since the sky never gets completely dark in late spring and early summer, it was difficult to block the light from outside. The owners of the Gakona Lodge just recently purchased the place, and as of my visit in June, 2015, they were still in the process of fixing it up. They have their work cut out for them. I can’t imagine restoring a nearly-100-year-old building under any circumstances, let alone in a place where there isn’t a Home Depot a mile away. The first floor of the lodge is their home, so don’t be surprised if you see some kids running around. In the morning, I enjoyed a complimentary breakfast in the next-door restaurant (not the bar, a different building). The employees/residents were having breakfast, and one of them brought a homemade breakfast cake for the group. They were nice enough to share a piece. It was great! The owners even gave me some packaging tape, so I could put together a box to send home, filled with my Alaskan souvenirs (which were overflowing from my suitcase). I mailed the box from Gakona’s tiny post office, down the street. And then, I was off, leaving the roadhouse behind, headed for Anchorage and my final day of the trip.